One approach to improving nurse staffing levels is increasing reimbursement to nursing facilities, on the assumption and expectation that nursing facilities will use some of the increased reimbursement to increase their staffing. This approach – at the federal level with Medicare and at the state level with Medicaid, in both Florida and California – has not been successful. Increased reimbursement led to little change in staffing. Moreover, nationwide, between 1990 and 1998, although total Medicare and Medicaid reimbursement to nursing facilities more than doubled, increasing from $24.8 billion to $51.0 billion, and resident acuity increased, nurse staffing levels remained stagnant. In 1997, Congress enacted a new prospective payment reimbursement system for Medicare. The system pays a daily rate to skilled nursing facilities (SNFs) that covers virtually all services needed by a resident. The rate is based on three components: nursing (which also includes social services and non-therapy ancillary services), therapy (based originally on one of 44 (now 66) resident assessment categories, which are called Resource Utilization Groups), and routine costs (which include capital, maintenance, and food). Following two large corporate bankruptcies, which the nursing home industry blamed on the new reimbursement system, Congress increased Medicare rates by 16.6% in the Medicare, Medicaid, and SCHIP Benefits Improvement and Protection Act of 2000 (BIPA). Congress specified that nursing facilities should use the increased funding for the nurse staffing component of the Medicare rate, but allowed SNFs to spend their Medicare reimbursement however they chose, once they received it. As a result, as found by the Government Accountability Office (GAO), the 2000 rate increase for nurse staffing did not appreciably increase nurse staffing rates. BIPA directed the GAO to provide guidance to Congress to help determine whether the rate increase should be continued. In a report entitled Skilled Nursing Facilities: Available Data Show Average Nursing Staff Time Changed Little after Medicare Payment Increase, the GAO found that although BIPA increased Medicare rates overall by 4-12% (on top of prior increases) and Congress had specified that the increased reimbursement should be spent on nursing, nurse staffing levels remained virtually stagnant after the increase became effective on April 1, 2001. The GAO found that skilled nursing facilities (SNFs) increased their nurse staffing by 1.9 minutes per day – “less than the estimated average increase, across all SNF patients, of about 10 minutes per patient day that could have resulted if SNFs had devoted the entire nursing component increase to more nursing time.” Moreover, the skill mix of the nurses changed. Increases in nurse staffing reflected increases in licensed practical nurses (0.7 minutes per patient day) and certified nurse assistants (2.9 minutes per patient day) while registered nurse (RN) coverage actually declined (1.7 minutes per patient day). The GAO concluded that “increasing the Medicare payment rate was not effective in raising nurse staffing” and so advised Congress. States increasing Medicaid rates in the hope of increasing nurse staffing levels have had a similar lack of success. The final incentive rules allowed both a minimum add-on of 50 cents per Medicaid day for all Medicaid providers, at an annual cost of nearly $8 million (75% of the appropriation) and a distribution of the remaining $23.7 million in incentive funds (25% of the total) to providers with the lowest staffing. The result was an average additional Medicaid payment of $1.96 per day, reflecting an increase of 1.8% in the Medicaid reimbursement rate. More than 90% of Florida nursing facilities applied for the additional funding. An evaluation by the state found that nursing facilities spent the money as required by the legislation, although not by increasing staffing levels. Additional state legislation enacted in 2001 mandated minimum nurse staffing ratios, to be implemented over a three-year period. When implementation of the ratios was delayed, due to budgetary concerns, the Legislature directed the state not to enforce the higher staffing standards. In 2000, Florida allocated $40 million in financial incentives to improve quality in nursing homes with the direct care staffing adjustment. These monies were spent on direct care as required by the law, but . . . , the total average hours per resident day did not increase until minimum staffing requirements were established. . . . [W]hen providers are allowed to spend reimbursement as they deem appropriate, direct care hours per resident day decrease. . . . [O]nly when minimum standards are established and enforced do hours of per resident care increase. Moreover, over the study period of 2002-2007, there was a “steady decline” in RNs. Facilities provided 18 minutes per resident day of registered nurse coverage in 2002 and 16.8 minutes per resident day in 2007. In addition, as direct care staffing increased, housekeeping staff declined in 2002 and 2003 and activity and recreational staff declined between 1999 and 2004. In 2004, the California Legislature enacted “a facility-specific, cost-based Medi-Cal reimbursement system for [freestanding] nursing homes.” The new payments established by the legislation became effective in May 2006 and continued through Fiscal Year 2008-2009. The Legislature anticipated that the rate increases would encourage “increases in staffing levels, higher wages and benefits, and improved quality of care.” The reimbursement system established seven geographically-based groups and five cost centers: “(1) direct care labor costs, (2) indirect care labor and non-labor costs, (3) administrative, (4) capital, and (5) direct pass-through costs for liability insurance and other costs.” Facilities could not shift costs from one cost center to another. Evaluating data from 995 free-standing facilities for a six-year period, 2001-2006, including the period of the rate increases, researchers found that “the average Medi-Cal revenues per day for nursing facility [sic] increased from about $124 per day in 2004 to $152 per day in 2006;” in subacute facilities, from $178 in 2004 to $222 in 2006; and in multilevel retirement communities, from $110 in 2004 to $148 in 2006. Total Medi-Cal payments increased by $590 million and funding from all sources increased by $1.1 billion. Researchers found that between 2001 and 2006, in nursing facilities (the largest category of facilities studied), “total nurse staffing levels increased . . . from 3.17 hours per resident day (hprd) . . . to 3.4 hprd,” a 7% increase. However, nurse staffing levels increased by only 3% between 2004 and 2006. Although RN coverage in nursing facilities increased by 1.4% between 2004 and 2006, RN hours actually decreased 8% between 2001 and 2006. The largest nurse increase occurred for the category of licensed vocational nurses (LVNs), with a 20% increase between 2001 and 2006, including a 9% increase between 2004 and 2006. Turnover at nursing facilities increased by 1.4% for all nursing categories between 2004 and 2006. Wages for nurse aides in nursing facilities increased 71 cents per hour (6.6%), from $10.61 per hour in 2004 to $11.32 per hour in 2006, but when these wages were adjusted for inflation, direct care workers’ wages actually decreased by 0.5% in the three-year period. In contrast, wages for administrators increased by 11.3% and wages for licensed nurses increased by 9% between 2004 and 2006. Benefits per hour for all employees declined between 2004 and 2006. Between 2004 and 2006, the “highest growth rate in expenditures” occurred in the category of administrative expenses (even after excluding the higher administrative expenses that resulted from the new payment methodology). Administrative expenses in nursing facilities increased from 19% of per day expenditures in 2004 to 22% of per day expenditures in 2006. While substantiated complaints for non-profit facilities declined by 30% between 2004 and 2006, substantiated complaints for for-profit facilities increased by 44% in the same period. Both deficiencies and citations increased by 6%. At this point, there is no evidence that the new Medi-Cal reimbursement incentives are sufficient to encourage increases in nursing staffing and increased wages and benefits, which are necessary to improve the quality of nursing home care and reduce staff turnover rates. Without attaching more specific minimum requirements for staffing levels and penalties for poor quality of care, the new payment system appears unlikely to achieve its goals. Evidence from federal and state efforts discussed here consistently demonstrates that increasing reimbursement to nursing facilities, without more, does not lead to improved staffing levels or improved wages and benefits for direct care workers. The GAO and researchers who studied Florida and California all suggest that explicit staffing ratios are required to improve staffing levels. Increasing reimbursement, by itself, is not an effective approach to improving nurse staffing in nursing facilities. Health Care Financing Administration, “Nursing Home Care Expenditures Aggregate and Per Capital Amounts and Percent Distribution, by Source of Funds: Selected Calendar Years 1960-98,” Table 7 http://www.hcfa.eov/statslnhe-oact/tables/57.htm, as cited in Statement for the Record Submitted by the Center for Medicare Advocacy, Senate Special Committee on Aging, Nursing Home Residents: Shortchanged by Staff Shortages, Part II, S. Hrg. 106-850 (106th Cong. 2nd Sess.) (July 27, 2000), http://www.aging.senate.gov/imo/media/doc/publications/7272000.pdf. Charlene Harrington, Helen Carrillo, Susan C. Thollaug, Peter R. Summers, Nursing Facilities, Staffing, Residents, and Facility Deficiencies, 1991 Through 1997 (Jan. 1999); Charlene Harrington, Helen Carrillo, Susan C. Thollaug, Peter R. Summers, Nursing Facilities, Staffing, Residents, and Facility Deficiencies, 1992 Through 1998 (Jan. 2000), as cited in Statement for the Record Submitted by the Center for Medicare Advocacy, Senate Special Committee on Aging, Nursing Home Residents: Shortchanged by Staff Shortages, Part II, S. Hrg. 106-850 (106th Cong. 2nd Sess.) (July 27, 2000), http://www.aging.senate.gov/imo/media/doc/publications/7272000.pdf. Charlene Harrington, Helen Carrillo, Susan C. Thollaug, Peter R. Summers, Nursing Facilities, Staffing, Residents, and Facility Deficiencies, 1992 Through 1998 (Jan. 2000), as cited in Statement for the Record Submitted by the Center for Medicare Advocacy, Senate Special Committee on Aging, Nursing Home Residents: Shortchanged by Staff Shortages, Part II, S. Hrg. 106-850 (106th Cong. 2nd Sess.) (July 27, 2000), http://www.aging.senate.gov/imo/media/doc/publications/7272000.pdf. Balanced Budget Act of 1997, Pub. L. No. 105-33, §4432. Pub. L. 106-554, App. F, §312(a). The Medicare, Medicaid, and SCHIP Balanced Budget Refinement Act of 1999 (BBRA) raised daily SNF payments by 20% for 15 (of 44) high-cost classifications of residents used in the prospective payment system, beginning April 2000, and increased the daily rate for all resident categories by 4% for fiscal years 2001 and 2002. Id. 6. Government Accountability Office (GAO), Skilled Nursing Facilities: Available Data Show Average Nursing Staff Time Changed Little after Medicare Payment, http://www.gao.gov/assets/240/236339.pdf. Id. Different types of facilities showed different changes in nurse staffing levels. “Nonchain SNFs had an increase of 3.9 minutes per patient day.” Id. 11. Chain nursing facilities increased their staffing by 0.5 minutes per day. Id. 29, Appendix II. For-profit facilities increased their nurse staffing levels by 1.3 minutes per patient day; not-for-profit facilities, by 2.7 minutes per patient day; and government facilities, by 5.0 minutes per patient day. Id. 29, Appendix II. Florida Nursing Homes: Staffing Levels, Quality and Costs (2002-2007), page 5 (Feb. 2009 (analysis of nurse staffing in Florida nursing facilities found that “staffing as measured by [hours per resident day] hprd increases when legislatively required, not with financial incentives.”), http://www.fdhc.state.fl.us/Medicaid/quality_management/mrp/pdfs/preliminary_nursing_home_staffing_analyses_usf_final_031109.pdf. Charlene Harrington, Janis O’Meara, Eric Collier, Taewoon Kang, Caroline Stephens, Jamie Chang, Impact of California’s Medi-Cal Long Term Care Reimbursement Act on Access, Quality and Costs page 1, April 1, 2008), http://legacy.sandiegouniontribune.com/news/health/images/080411nursinghomestudy.pdf. Id. 62. See also Charlene Harrington, “Nurse Staffing Levels and Medicaid Reimbursement Rates in Nursing Facilities,” Health Services Research 42:3, Part 1, 1105 (June 2007), http://www.blackwell-synergy.com/doi/abs/10.1111/j.1475-6773.2006.00641.x (abstract), http://pub.ucsf.edu/newsservices/releases/200705294/ (news release). As part of the Center’s ongoing project on approaches to improve nurse staffing levels in nursing facilities, this week we are posting a paper on “Increasing Reimbursement.” This approach increases reimbursement to nursing facilities on the assumption and expectation that nursing facilities will use some of the increased reimbursement to increase their staffing levels. This approach – at the federal level with Medicare and at the state level with Medicaid, in both Florida and California – was not successful. Increased reimbursement led to little change in staffing. For the full paper, please go to http://www.medicareadvocacy.org/increasing-reimbursement-to-improve-staffing-levels/. Nurse aides earn “near-poverty wages.” Nationwide, the median wage is $11.51 per hour, an annual salary of $19,000. Half of direct care workers earn even less. Nearly 20% of workers live in households below the federal poverty line. More than a third of them (38%) rely on various public benefits, including public assistance, Medicaid, food stamps, and cash assistance. Adjusted for inflation, workers’ wages “have decreased by 7 percent over the last decade.” Since most of the nurse aides are female (91%) and non-white (53%), gender and race contribute to the marginalized nature of the direct care workforce. PHI suggests “Attracting nursing assistants to the field requires better pay – but keeping them requires sufficient preparation for an increasingly complex job.” Here, too, the nursing home industry falls short. Federal requirements for training for direct care workers have not changed since the federal Nursing Home Reform Law was enacted in 1987. Federal rules continue to require just 75 hours of training, although 13 states now require between 120 and 180 hours. Since 1987, the acuity of residents has increased, making aides’ jobs more complex and the need for more training more acute. Although there is general recognition that nursing homes are understaffed, PHI estimates that 75.6% fail to meet the staffing levels recommended by the Centers for Medicare Medicaid Services nearly 15 years ago, in its 2002 report, a time of lower resident acuity. The result of low wages, poor training, high injury rates, and understaffing is high rates of turnover, costing $3500 per worker and $6 billion annually. The nursing home industry is becoming increasingly for-profit, chain-operated, and, in the most recent trend, owned by private equity firms. Although PHI reports that ownership by private equity firms, in particular, is associated with higher profit margins, the Medicare Payment Advisory Commission reported in January 2016 that Medicare profit margins for the nursing home industry have exceeded 10% for the past 15 years. Medicare pays for 14% of residents, Medicaid for 63% of residents – a total of more than $80 billion in public funding in 2014. PHI cites the growing movement for a $15 per hour wage, the “Fight for $15” campaign that was described by Leslie Frane, Director of Service Employees International Union (SEIU) Healthcare, and Sarita Gupta, Co-Director of Caring Across Generations at the Center for Medicare Advocacy’s April 1 National Voices of Medicare Summit. PHI suggests that increases in public reimbursement must be targeted to workers’ salary and benefits through such programs as wage pass-through programs, “voluntary supplemental payments for improving wages,” “direct-service requirement,” and greater transparency about workers’ wages. Direct care workers need higher wages, benefits, better training, and opportunities for career advancement. As attorneys and advocates for people who need long-term care services, the Center for Medicare Advocacy strongly supports the movement to improve direct care workers’ lives. PHI’s comprehensive report sets out the issues and the solutions. PHI, Raise the Floor: Quality Nursing Home Care Depends on Quality Jobs (April 2016) [hereafter Raise the Floor], http://phinational.org/sites/phinational.org/files/research-report/phi-raisethefloor-201604012.pdf. PHI’s mission is promoting quality care through quality jobs. http://phinational.org/about. Raise the Floor, supra note 1, 4. 42 U.S.C. §§1395i-3(a)-(h), 1396r(a)-(h), Medicare and Medicaid, respectively. Raise the Floor, supra note 1, 19. Id. 11 (70% of nursing facilities are operated on a for-profit basis). Id. 11 (more than half of nursing facilities are operated by chains). Id. 11. See “Nursing Facilities Owned by Private Equity Firms: Fewer Nurses, More Deficiencies,” (CMA Alert, Aug. 20, 2014), http://www.medicareadvocacy.org/nursing-facilities-owned-by-private-equity-firms-fewer-nurses-more-deficiencies/. Raise the Floor, supra note 1, 12. See Government Accountability Office, Private Investment Homes Sometimes Different from Others in Deficiencies, Staffing, and Financial Performance, GAO -1-571 (July 2011), http://www.gao.gov/assets/330/321067.pdf. Raise the Floor, supra note 1, 12. Raise the Floor, supra note 1, 23. PHI cites legislation in Pennsylvania that would create a living wage certification program. See Center for Medicare Advocacy, The Public Cost of Low-Wage Nursing Home Jobs: Pennsylvania Proposals to Stop Hidden Public Subsidies to Nursing Home Injury” (CMA Alert, Dec. 23, 2015), http://www.medicareadvocacy.org/the-public-cost-of-low-wage-nursing-home-jobs-pennsylvania-proposals-to-stop-hidden-public-subsidies-to-nursing-home-industry/. Raise the Floor, supra note 1, 23-26. The Center has written about many of the worker issues before. See “The Public Cost of Low-Wage Nursing Home Jobs: Pennsylvania Proposals to Stop Hidden Public Subsidies to Nursing Home Injury” (CMA Alert, Dec. 23, 2015), http://www.medicareadvocacy.org/the-public-cost-of-low-wage-nursing-home-jobs-pennsylvania-proposals-to-stop-hidden-public-subsidies-to-nursing-home-industry/; “Is the Movement for a Higher Minimum Wage Coming to Health Care?” (CMA Alert, Jun. 4, 2015), http://www.medicareadvocacy.org/is-the-movement-for-a-higher-minimum-wage-coming-to-health-care/#_edn7. 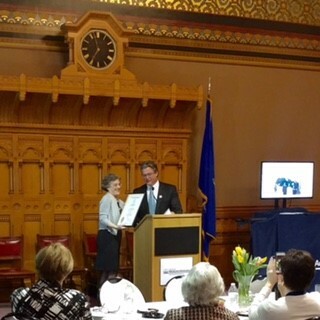 CT Sen. Ted Kennedy, Jr. presents Center for Medicare Advocacy Executive Director Judith Stein with a citation at the Center’s 30th anniversary party. On Wednesday, April 13, 2016 the Center for Medicare Advocacy held a reception at the Connecticut State Capitol to celebrate 30 years working for fair access to Medicare and health care. The gathering included Center staff and alumni, representatives from both the state and federal government, other advocates, and provider organizations. Ms. Stein then introduced the evening’s keynote speaker, Connecticut State Senator Ted Kennedy, Jr. Senator Kennedy explained his own passion for ensuring access to healthcare, particularly for people with disabilities, and congratulated the Center for embracing the mission with the same zeal. The Senator went on to thank the Center, and Ms. Stein in particular, for their work on the Jimmo v. Sebelius “Improvement Standard” case, which ensures that ongoing needed skilled care is not limited by an individual’s improvement, but can be delivered to maintain a condition or prevent it from getting worse. After the Senator’s remarks there were video greetings from Connecticut’s entire Congressional delegation, including Sen. Chris Murphy, who thanked the center for getting him up to speed on health policy. Rep. Rosa DeLauro and Sen. Richard Blumenthal, who recently worked with the Center to take on Medicare Advantage network adequacy issues offered gracious acknowledgment of the Center’s efforts. Rep. John Larson expressed gratitude for the Center, and Ms. Stein in particular. Reps. Jim Himes and Elizabeth Esty emphasized the value and importance of the Medicare program the Center works so hard to protect. Rep. Joe Courtney thanked the Center, with whom he has long worked, for efforts on issues from Medicare Part D access to the ongoing Observation Status crisis. The formal presentations concluded with a moving video from Steve Gleason, delivered through the use of his speech-generating device with eye-gaze technology, thanking the Center for its part in getting Medicare to change its policy to cover this technology. Steve is an extraordinary advocate and inspiration for people living with ALS and other debilitating conditions. The Center thanks all the advocates, providers, legislators and staffers who have shared our mission for the past 30 years. We look forward to continuing to work together for access to Medicare and quality health care for years to come. Reports that 20% or more of unplanned hospital readmissions are avoidable has led to considerable interest in policymakers in reducing readmissions. Actively reducing hospital readmissions is seen as a route to lower Medicare spending and improved patient care. The Affordable Care Act (ACA) established a penalty program for preventable readmissions. Under the Hospital Readmissions Reduction Program, since Fiscal Year 2012, hospitals have had their Medicare reimbursement reduced if certain patients were readmitted within 30 days of discharge. Other payment and delivery system reforms enacted in the ACA, such as bundled payments and accountable care organizations, also seek to improve transitions from acute care to post-acute settings, thereby reducing hospital readmissions. Skilled nursing facilities will be eligible for incentive payments for reducing hospital readmissions under a Value-Based Purchasing Program that was enacted as part of the Protecting Access to Medicare Act of 2014. While many efforts focus on payment reforms that discourage or penalize avoidable readmissions or (for skilled nursing facilities) reward nonhospitalization, a new study focuses on the causes of readmissions. “Preventability and Causes of Readmissions in a National Cohort of General Medicine Patients” is “an observational study . . . of 1000 general medicine patients readmitted within 30 days of discharge to 12 US academic medical centers between April 1, 2012, and March 31, 2013.” Researchers interviewed patients; surveyed up to five physicians for each patient (including the patient’s primary care physician, physician from the original hospital admission [called the index admission], and current attending physician); reviewed inpatient and outpatient medical records; and had two physicians independently review the results for each patient and determine whether the patient’s readmission was preventable. The physicians’ reviews, which included the patient interview, complete medical record, and at least one physician survey, had “2 key objectives: (1) to determine whether readmission was potentially preventable and (2) to identify factors that contributed to readmission, regardless of preventability.” In their reviews, physicians compared what they found with “an ‘ideal health system.’” This frame of reference meant, for example, that if a readmission was related to a patient’s inability to get a post-discharge appointment, the readmission was determined to be preventable. Although patients who were rehospitalized generally reported similar hospital experiences in their initial hospital stays, whether or not their readmission was determined to be potentially preventable, patients who reported not knowing how to reach their physician after discharge from the hospital were more likely to have their readmission classified as potentially preventable. Facts not associated with potentially preventable readmissions were patients’ functional status, reports of care processes, and satisfaction. The research supports the need for better discharge planning by hospitals and better coordination of care between acute care hospitals and post-acute providers. See the Center for Medicare Advocacy’s materials on discharge planning. An early article on this issue is Stephen F. Jencks, Mark V. Williams, Eric A. Coleman, “Rehospitalization among Patients in the Medicare Fee-for-Service Program,” New England Journal of Medicine 2009;360:1418-28 (updated Apr. 2, 2009), http://www.nejm.org/doi/pdf/10.1056/NEJMsa0803563. Section 3025 of the ACA, 42 U.S.C. §1395ww(q); 42 C.F.R. part 412 (§412.150 through §412.154). CMS, Readmissions Reduction Program (HRRP), https://www.cms.gov/medicare/medicare-fee-for-service-payment/acuteinpatientpps/readmissions-reduction-program.html. Section 3022 of the ACA, 42 U.S.C. §1395jjj. Pub. L. 113-93, §215, codified at 42 U.S.C. §1395yy(g). The Center reported decades worth of research and evidence documenting that having more nurses in nursing facilities reduces rehospitalization of residents. See CMA, “More Nurses in Nursing Homes Would Mean Fewer Patients Headed to Hospitals,” (Alert, March 10, 2011), http://www.medicareadvocacy.org/more-nurses-in-nursing-homes-will-mean-fewer-patients-headed-to-hospitals/. JAMA Internal Medicine doi:10.1001/jamaintermed.2015.7863 (published online, March 7, 2016), http://archinte.jamanetwork.com/article.aspx?articleid=2498846. Alfred J. Chiplin, Jr., “Breathing Life into Discharge Planning” (May 31, 2004), http://www.medicareadvocacy.org/wp-content/uploads/2013/08/Discharge_BreathingLifeIntoDischargePlanning06.22.04.pdf; CMA, “Discharge Planning: Rights and Procedures for Medicare Beneficiaries in Various Care Settings,” http://www.medicareadvocacy.org/medicare-info/discharge-planning/; CMA, Discharge Planning, http://www.medicareadvocacy.org/?s=discharge+planningop.x=0op.y=0. Issue: Whether the Secretary violated the Medicare statute and the Due Process Clause by not recognizing that Vitamin B-12 injections represent a per se skilled nursing service and therefore the service should have been covered, and, in general, by failing to recognize the right to coverage for per se skilled nursing services. Relief sought: Declaratory and injunctive relief prohibiting the Secretary from not covering a per se skilled nursing service, and reversal of the decision denying coverage. Status: On December 28, 2015, the Secretary filed a motion to remand, which plaintiff opposed. The motion is pending. Plaintiff has served discovery requests that are to be answered by May 19. Issue: Whether the extremely high denial rates (98% and higher) at the redetermination and reconsideration stages of administrative review for home health care claims violate the Medicare statute and the Due Process Clause. Relief sought: Declaratory and injunctive relief requiring the Secretary to correct the existing system of lower level review denials by revising guidelines, educating and monitoring contractors, and providing re-review of denied claims for the named plaintiff and class members. Status: Shortly after the complaint was filed, the plaintiff moved for certification of a nationwide class of home health beneficiaries. The defendant moved to dismiss, on the grounds that the plaintiff had failed to exhaust administrative remedies and that plaintiff had not stated a claim for relief. Both of those motions were fully briefed, and were argued to the court on February 29, 2016. No decision has issued yet. In proposed rules updating Medicare reimbursement to acute care hospitals, the Centers for Medicare Medicaid Services (CMS) announces how it intends to implement the Notice of Observation Treatment and Implication for Care Eligibility Act (NOTICE Act). Effective August 6, 2016, the NOTICE Act requires that hospitals provide written and oral notice, within 36 hours, to patients who are in observation or other outpatient status for more than 24 hours. The notice must explain the reason that the patient is an outpatient and describe the implications of that status both for cost-sharing in the hospital and for subsequent “eligibility for coverage” in a skilled nursing facility (SNF). Comments on the proposed rules are due June 17, 2016. In a separate Alert, the Center for Medicare Advocacy will report on other issues in the Notice of Proposed Rulemaking that may be of interest to Medicare beneficiaries. CMS describes the issue as outpatients receiving “observation services.” In reality these patients are patients in hospitals who receive medical, physician and nursing care, tests, medications, overnight lodging and food, but who are called outpatients. The Center for Medicare Advocacy calls this issue “outpatient Observation Status” because there are no hospital services that are distinctly “observation” and because these “outpatients” receive care and treatment that are identical to the care and treatment received by inpatients. Currently, Medicare patients who are in the hospital for three days or more are nonetheless sometimes considered “outpatients.” As a result, thousands of vulnerable older adults and people with disabilities are denied their Medicare skilled nursing facility benefit. Since care received by hospital “outpatients” in Observation Status is indistinguishable from that received by inpatients, patients should have all time spent in Observation Status count toward the three-day hospital stay requirement for coverage of post hospital nursing home care. “Observation Status,” a hospital billing code, should not affect beneficiaries’ coverage of necessary post-hospital care. CMS describes how observation status comes about: “Typically, observation services are ordered for individuals who present to the emergency department (ED) and who then require a significant period of treatment and monitoring to determine whether or not their condition warrants inpatient admission or discharge.” CMS insists that “in the majority of cases,” the decision about admission or discharge “can be made in less than 48 hours, usually in less than 24 hours.” It suggests that only “in rare circumstances” is a patient’s inpatient status changed to outpatient, under Condition Code 44. The MOON is not required for all outpatients. CMS proposes to require hospitals to give the MOON only to patients entitled to Medicare for whom they are billing Medicare for observation hours. However, patients who do not have Medicare Part B will also receive the MOON, even though their observation status stay or other outpatient stay in the hospital will not be covered by Medicare Part B because they do not have Part B.
CMS states explicitly, in both the preamble and the proposed regulatory language, that the NOTICE Act does not give patients any appeal rights. When it implemented the two-midnight rule, CMS cut Medicare reimbursement to hospitals by 0.2%, reflecting its determination that there would be more inpatient stays as a result of the new rule. The hospitals sued and challenged the cut in reimbursement. In the same set of proposed rules, “in light of recent review and the unique circumstances surrounding this adjustment,” CMS retroactively restores full reimbursement to hospitals. First, the Center for Medicare Advocacy is concerned that the proposed rule does not require the hospital to explain in the MOON the specific reason the patient is being considered an outpatient. This decision is contrary to all other Medicare notices. In both traditional Medicare and Medicare Advantage, CMS requires health care providers and plans to explain in detail the specific reasons why they believe Medicare coverage is not available. For example, in traditional Medicare, independent laboratories, home health agencies, hospices, physicians, practitioners, and suppliers must use the Advance Beneficiary Notice; skilled nursing facilities must use the SNF ABN;and hospitals must use the Hospital-Issued Notice of Noncoverage. Medicare Advantage plans must issue a Notice of Denial of Medical Coverage (or Payment). The proposed MOON is unique in its mandated use of a blanket statement, not tailored to the patient, which fails to require an explanation of the basis for the lack of inpatient coverage. Moreover, CMS’s proposal not to require information about the specific reason a patient is in observation status is contrary to the legislative history of the NOTICE Act, which sought to give patients “meaningful disclosure” of their status in the hospital. Requiring standardized language about the “reason” for being placed on Observation Status, which CMS has declared by fiat, thwarts the purpose of delivering information. Second, all Medicare notices of coverage determinations other than the MOON give beneficiaries an opportunity to appeal to Medicare for a determination of coverage. Only the MOON defines the coverage issue as non-appealable. Just as beneficiaries can challenge a premature discharge or contest a host of other coverage determinations in the Medicare program, they should be able to appeal their placement on Observation Status. Third, the MOON will not be required for patients whose hospitals choose not to code their “outpatient” Medicare bills as Observation Status. This decision affects many hundreds of thousands of people. The HHS Inspector General reported in 2013 that in 2012, 1.5 million patients had hospital stays that were classified as observation (because the hospital billed Medicare for observation hours) and another 1.4 million patients had long outpatient stays that were not coded as observation (because the hospital did not bill Medicare for observation hours). In other words, about half the long-stay outpatients were not considered observation status, but solely because the hospital chose not to bill Medicare for observation hours. However, the consequences for patients remained the same. Whether the hospital billed Medicare for observation hours or not, the patient’s post-hospital care in the SNF was not covered because the patient was classified as an outpatient by the hospital. CMS’s decision not to require the MOON for all outpatients is contrary to the legislative history of the NOTICE Act, which requires hospitals to provide information to patients about whether they are inpatients or outpatients. CMS’s decision also exacerbates the arbitrariness of observation status. Not only does it remain arbitrary whether patients are called outpatients or inpatients, it is now also arbitrary whether hospitals are required to give the MOON to outpatients. CMS repeats in the preamble its belief that use of Condition Code 44 (which allows hospitals to change a patient’s status from inpatient to outpatient) is rare and that the decision to admit to inpatient is usually made with 48 hours, usually less than 24 hours. The Center’s experience is to the contrary. We hear regularly from people all over the country whose status was changed from inpatient to outpatient or who remained in the hospital for multiple days (five and six days and more), all classified as outpatient, even after the “Two-Midnight Rule” was announced. Finally, CMS expresses no concern about the impact of Observation Status on Medicare beneficiaries and their need to pay out-of-pocket for care in a SNF that would have been paid by Medicare Part A if their hospital had classified them as inpatients. Although CMS has the authority to count all time in the hospital for purposes of determining a beneficiary’s entitlement to Part A coverage of a post-hospital stay in a SNF, it has refused to revise its Manuals to authorize this coverage. In these new proposed rules, it has also declined the opportunity to provide real and meaningful relief to Medicare beneficiaries who are called outpatients by their hospitals. Congress needs to act by passing the bill that would do so, The Improving Access to Medicare Coverage Act of 2015 (H.R.1571/S.843). The proposed rules, CMS-1655-P, went on public view April 18, 2016 and were published in the Federal Register on April 27, 2016, 81 Fed. Reg. 24945, https://www.gpo.gov/fdsys/pkg/FR-2016-04-27/pdf/2016-09120.pdf. .
 Pub. L. 114-42. The NOTICE Act was signed by President Obama on August 6, 2015. See Center for Medicare Advocacy, “Observation Status: The NOTICE Act Will Soon Be Law,” (CMA Alert, Aug. 6, 2015), http://www.medicareadvocacy.org/observation-status-the-notice-act-will-soon-be-law/. 81 Fed. Reg. 24945, 25131 (April 27, 2016). The “subsequent eligibility” is actually non-eligibility. Medicare Part A pays for a resident’s stay in a SNF only if the resident spent at least three days as an inpatient in the hospital. As CMS acknowledges in the preamble, “For purposes of Medicare SNF coverage, the time spent receiving observation services as an outpatient does not count towards the requirement of a 3-day hospital inpatient stay because these services are outpatient.” 81 Fed. Reg. 24945, 25134. 80 Fed. Reg. 39199, 39349, 39350 (July 8, 2015), https://www.gpo.gov/fdsys/pkg/FR-2015-07-08/pdf/2015-16577.pdf. See Center for Medicare Advocacy, “Proposed Revisions to ‘Two-Midnight’ Rule Provide Little, If Any, Relief for Medicare Beneficiaries Stuck in the Hospital in Observation Status” (Alert, July 9, 2015), http://www.medicareadvocacy.org/proposed-revisions-to-two-midnight-rule-provide-little-if-any-relief-for-medicare-beneficiaries-stuck-in-the-hospital-in-observation-status/. 81 Fed. Reg. 24945, 25133 (April 27, 2016). CMS, “Hospital Inpatient Prospective Payment System (IPPS) and Long Term Acute Care Hospital (LTCH) Proposed Rule Issues for Fiscal Year (FY) 2017” (Fact Sheet, April 18, 2016), https://www.cms.gov/Newsroom/MediaReleaseDatabase/Fact-sheets/2016-Fact-sheets-items/2016-04-18-2.html. CMS may take the position that there is no denial when a patient is classified as observation status because the hospitalization will be covered as an outpatient stay under Part B. The reality is that being put on observation functions as a denial. Patients on observation are denied coverage of self-administered drugs while at the hospital, as well as coverage of post-hospital skilled nursing facility care. Patients with Medicare Part A only are denied Medicare coverage altogether for their hospital stay. CMS should not rely on a forced and counterintuitive definition of “denial” to disallow appeal rights. See CMS forms cited at footnotes 15-19, supra. Office of Inspector General, Hospitals’ Use of Observation Stays and Short Inpatient Stays for Medicare Beneficiaries,” OEI-02-12-00040 (July 29, 2013). See Center for Medicare Advocacy, “Observation Status: OIG Provides an Analysis and CMS Issues Final Regulations” (Alert, Aug. 8, 2013), http://www.medicareadvocacy.org/observation-status-oig-provides-an-analysis-and-cms-issues-final-regulations/. H. Rept. 114-39 (114th Cong. 1st Sess. ), https://www.cms.gov/Medicare/Medicare-General-Information/BNI/Downloads/2016-NOTICE-Act-Listening-Session-Transcript-v508.pdf. 81 Fed. Reg. 24945, 21532. See Michelle Stein, “Cavanaugh: Some Hospitals Continue Long Observation Stays Despite CMS Policy Shift,” Inside Health Policy (April 8, 2016). For many years, CMS has expressed concern with the impact of observation status on Medicare beneficiaries. On August 24, 2010, CMS held a Listening Session on observation status to consider hospitals’ increased and extended use of observation status. That year, CMS sent letters to the national hospital associations asking why they used observation status for extended periods. In 2012, in proposed and final rules for the outpatient prospective payment system, CMS again expressed concern about the increasing amount of time that patients spend in the hospital under observation. 77 Fed. Reg. 45155 (July 30, 2012) (proposed rules); 77 Fed. Reg. 68426 (Nov. 15, 2012). In proposed rules published in March 2013 addressing the Part A-B hospital rebilling issue, CMS repeated its concerns about lengthy observation stays. 78 Fed. Reg., 16632, 16634 (Mar. 18, 2013). The Center for Medicare Advocacy submitted a memorandum to Sean Cavanaugh, CMS, at his request in July 2014. CMS has not responded to the memorandum.